Chju Juntsi came to St. Petersburg. His visit's programme includes negotiations with M. Kasiyanov, the head of Russian government, visiting the Russian Museum, Ekaterininsky Palace,Peterhoff. 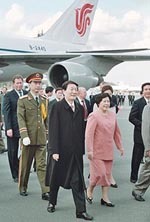 The CPR's State Council Premiere Chju Juntsi is accompanied by his spouse, Lao Ang. City news archive for 10 September' 2001.